In retrospect, I wish we had started making wine sooner. Creating/crafting alcoholic beverages is addicting. To date, we’ve bottled 5 gallons of Hell Hath No Fury Red, with another five gallons to be bottled in a month or so. This is good, because out of the original 30 bottles? there are 3.5 left, LOL…No, I didn’t drink it all; we gave the bulk of it away for Christmas. 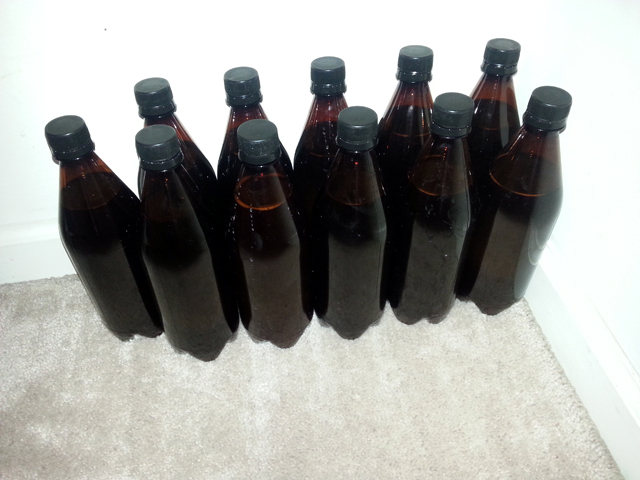 🙂 I am in the process of prepping my 2 gallons of dry mead for back sweetening, and we bottled our first beer yesterday. Yes, you read right. We did beer! My dad recommended the “Mr. Beer” kit, and we just so happened to have found an LBK kit at Dunham’s Sports a couple weeks ago and decided to give it a try, since it was marked waaaaay down. I figured if it was good enough for Dad, it’d be good enough for Johnny, so I picked this up as an early birthday gift for him (his birthday is next week). Unlike wine, beer with Mr. Beer is good for almost instant beverage satisfaction in that it will be ready to drink in 4-5 weeks, as opposed to months and months. This was a fun introduction into home beer brewing. It was all fairly simple. We boiled four cups of water and then removed from heat. 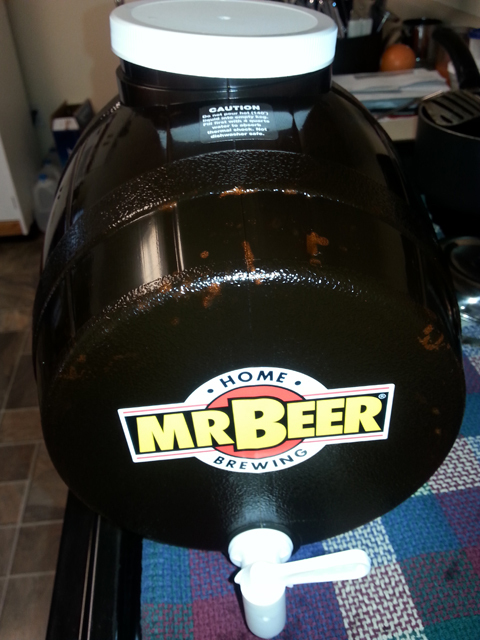 We then added the can of Hopped Malt Extract to the water and stirred until well mixed, creating an easy-peasy wort. We filled the cute keg fermenter with cold spring water to the 4-liter mark, then poured the wort into the keg, and topped off to the 8.5 liter mark with more cold water. We gave it a good stir, sprinkled yeast onto the surface of the wort, screwed on the lid and walked away for 12 days. Because I needed to get to the wine store for a couple chemicals I didn’t have for back sweetening my mead, we went ahead and picked up a few things while we were there so that I could start a one gallon batch of sweet mead. We needed some extra air locks, and while there, Johnny jumped headlong into “real” beer making, as it were. The wonderful guy over there at American Brewmasters put a box of goodies together for a five gallon batch of Irish Red Ale. I’ll be posting about that in the coming days, as I suspect we will be starting that within the week. I’ll be starting the must for the sweet mead tonight, and am really excited to play with a small batch. I suspect there are much worse habits/hobbies to have, and homemade wine makes our friends and family very happy. It also allows me to become a bit of a mad scientist, as well. More sugar? Less sugar? Add oak? Add spices and other fruits? The possibilities are endless! What hobbies do you have that you can’t seem to get enough of because you enjoy them THAT much? 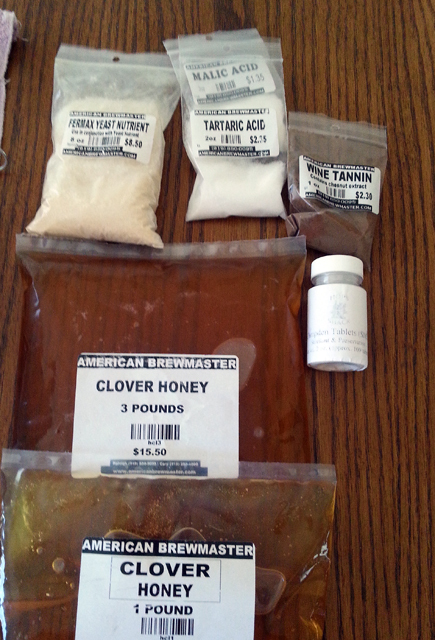 This entry was posted in Beer, DIY, HomeMade, Wine and tagged beer, home brewing, Mead, Mr. Beer kit, sweet mead, wine making. Bookmark the permalink. 8 Responses to Oh, the Alcohol! I was really young when my (cough, cough, ahem, Chemical Engineer) father and my older brothers tried to do either the beer or wine at home kit thing. Using recycled bottles. Can’t remember what “went wrong” only that we were sitting at the dining room table eating supper one night when Mama said “What was that?” And then, That, and THAT!!! The tops (or corks?) all started popping on their “project” in the basement! You better believe the men-folk had to take on some SERIOUS basement cleaning THAT night! I need my wine and mead…..whine whine whine! !